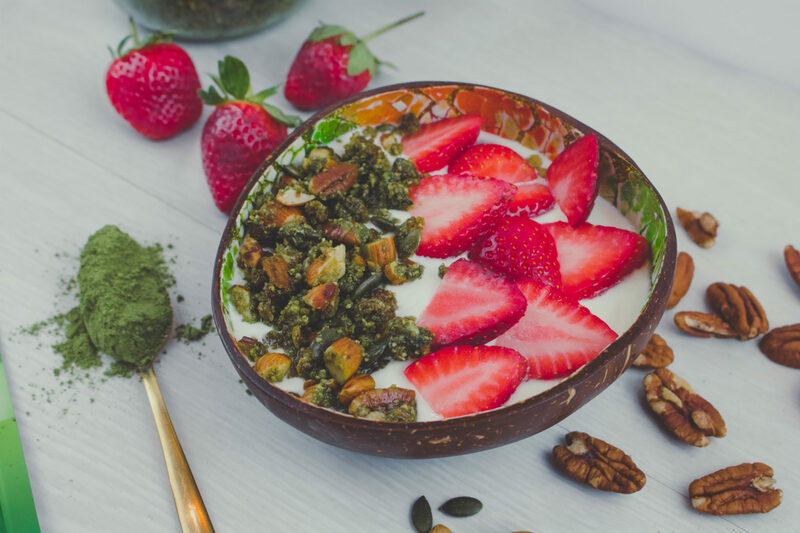 Forget about sugary shop-bought cereal and make this Supergreens granola for breakfast instead! The Supergreens adds an amazing green colour and a delicious subtle apple flavour. You can make this recipe your own by using whichever nuts or seeds you like. To personalise the recipe even further, you can add oats or dried fruit. Preheat oven to 325°F/170°C/gas mark 3. Line a baking tray with greaseproof paper. In a medium bowl, stir together 1 tbsp of the Supergreens powder with the syrup or honey, coconut oil, salt and vanilla. Add the chopped almonds to the bowl along with the ground almonds, pecans and pumpkin seeds. Stir until the mixture comes together and the nuts are well coated. Break up the mixture and spread over the baking tray, then place into the oven for 15 minutes. Remove from the oven and break up the granola into smaller pieces if desired and place back into the oven for a further 10 minutes. Leave to cool before transferring to an airtight jar. Add the remaining 1 tsp of Supergreens powder, put the lid on the jar and then shake to distribute the powder over all of the granola.